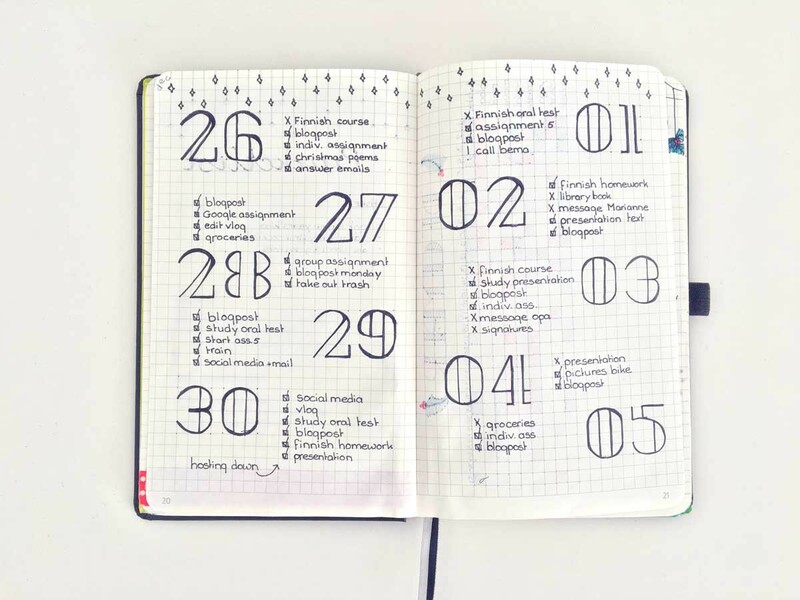 In the beginning of my Bullet Journal days, I hated the fact that my daily pages weren’t consistent. However, I came to like the fact that I have the opportunity to experiment with my lay-outs and find the layout that suits me best in the process. If you want a layout with lots of space for daily journaling or a layout with a minimal feeling, I have just the layout for you. 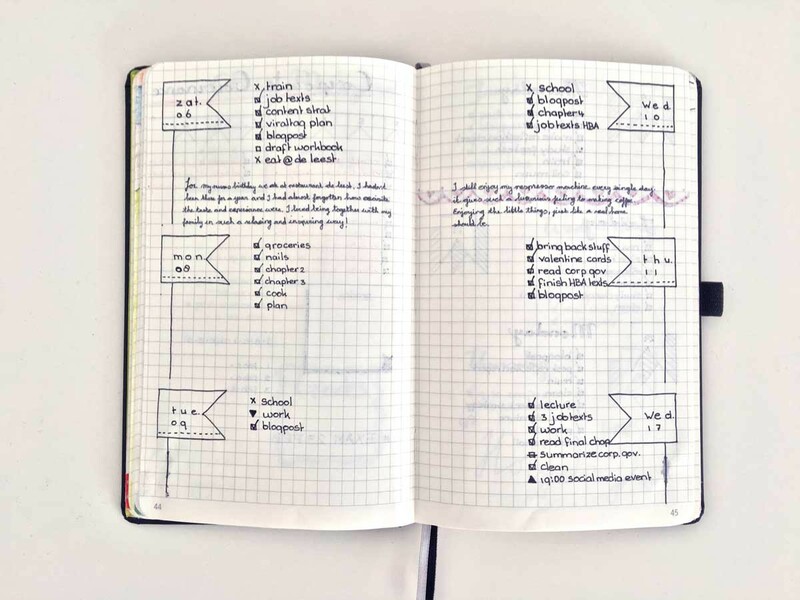 In this blogpost I share 15 different Bullet Journal layouts from my Bullet Journal. Will you join me? This is the very first daily page I created in my Bullet Journal. Even tough it is the first one, it is still my favorite layout of all time. Practical but with just enough color. 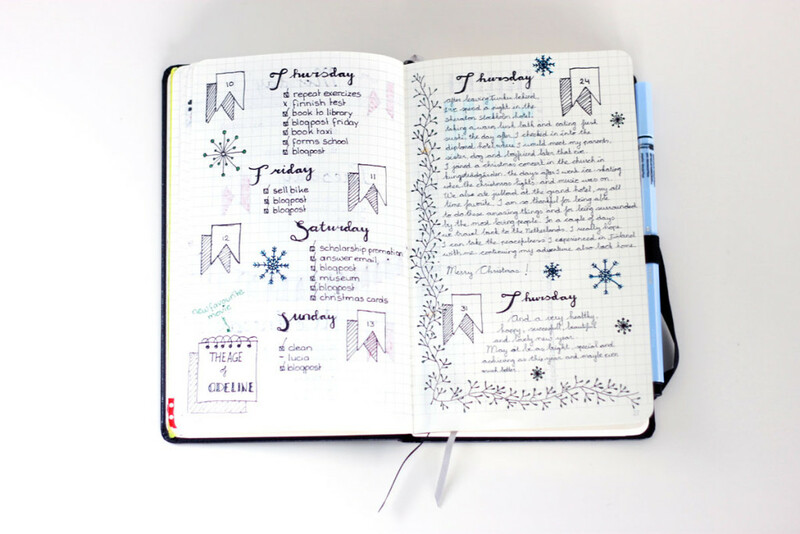 Another favorite is this layout that I also created somewhere in the beginning of my Bullet Journal career. This one has less straight lines and more round ones then the last layout. The tree on the left is the same one as the one in the previous layout, only now fall is proceeding into winter. This layout is perfect in black and white. 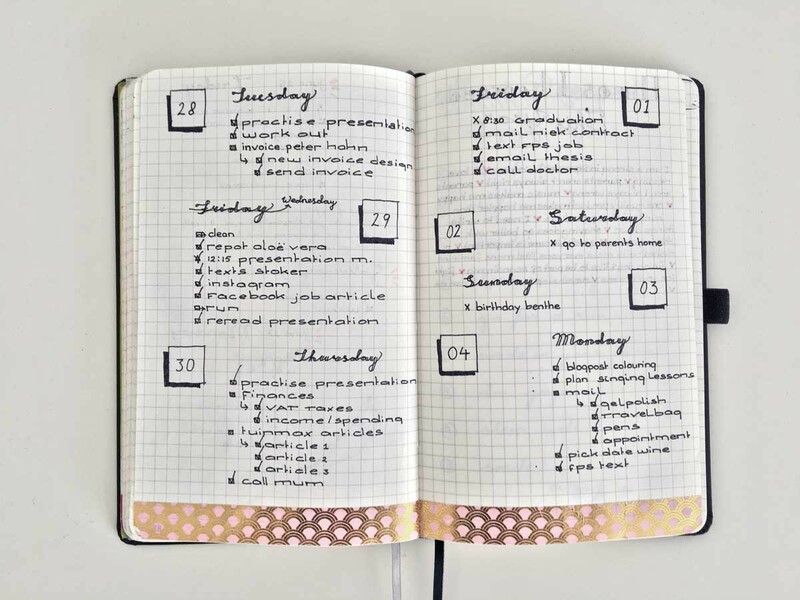 There is enough space for noting all daily tasks, only some less space for journaling. I love the font of the numbers, it’s so beautiful! 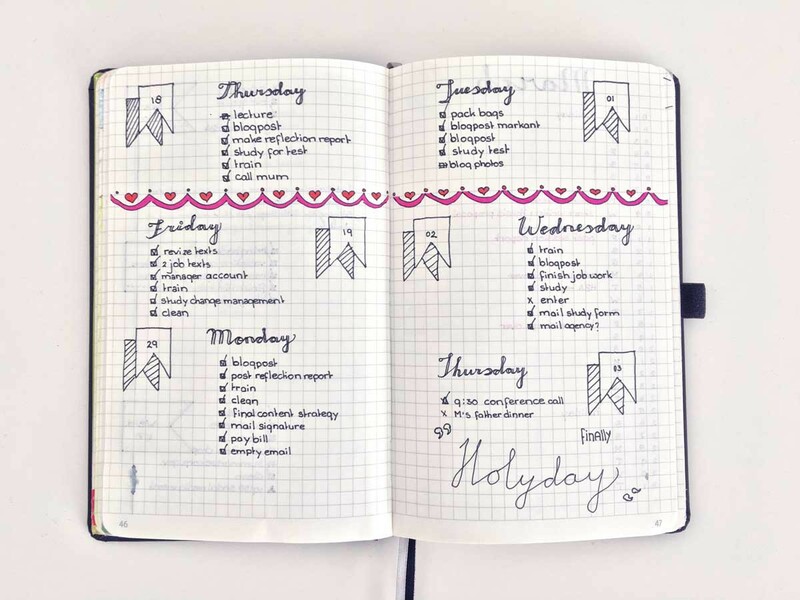 This layout makes me think of the christmas holiday, even without reading the journaling I did. The fine borders and the snowflakes bring back all memories. However, there is more then enough space for journaling, just in case. A completely different layout then all previous ones. More modern and with smaller titles. 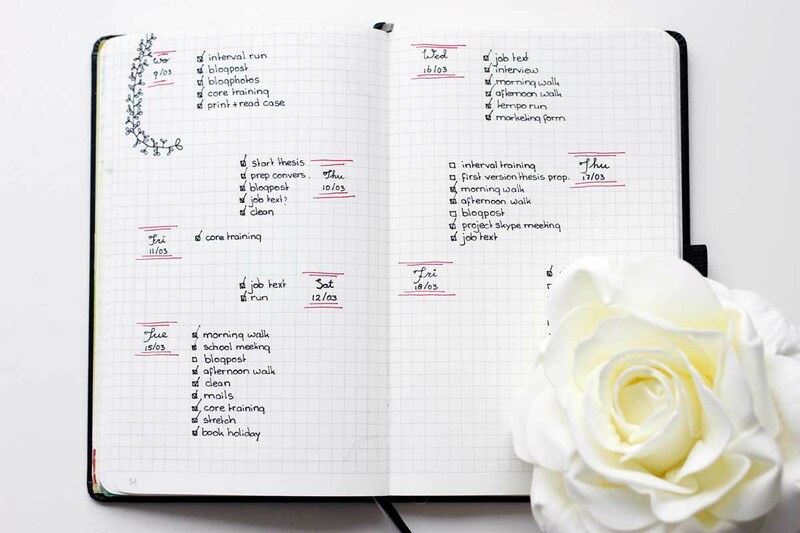 This leaves more space for tasks and appointments. The dotted line marks clearly where one day ends and another one starts. Again a very different layout then the previous ones. 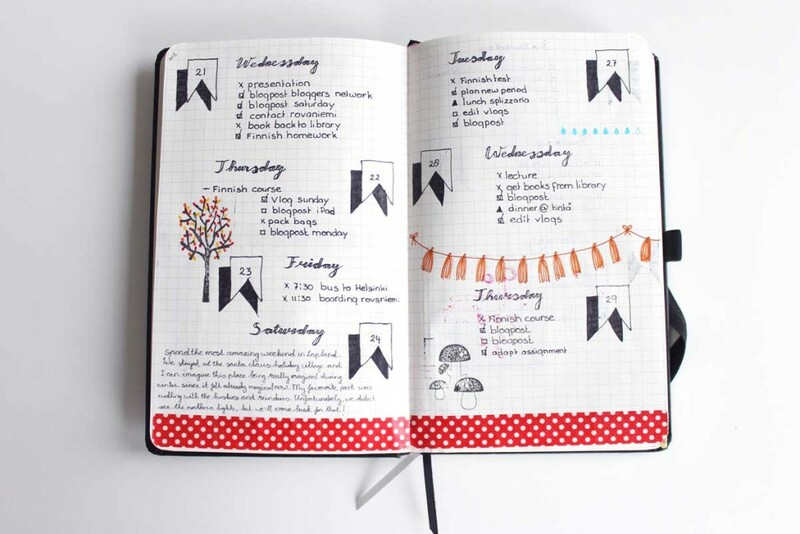 Right beside the flags with the day and the date, there is enough space to write down all your tasks. Beneath that, there is more then enough space for daily journaling. 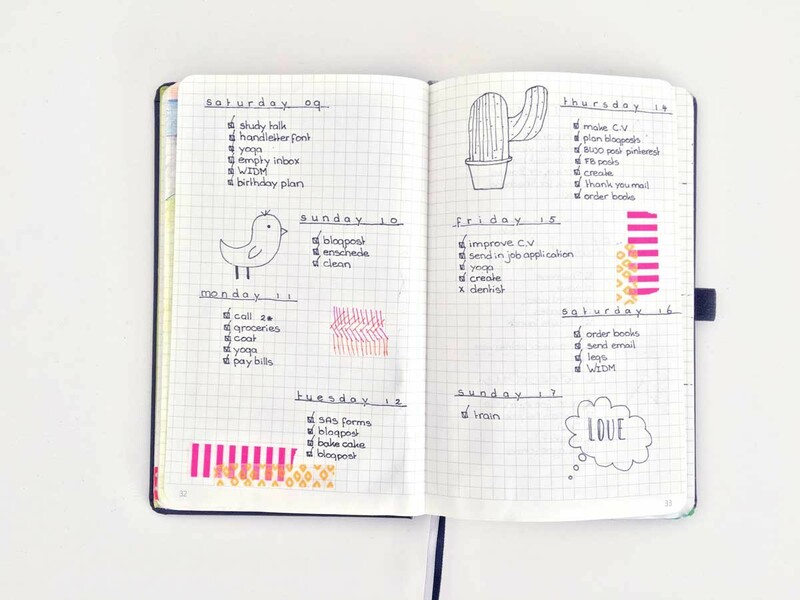 This layout is perfect for those who want to combine their Bullet Journal and their daily journal. A hand drawn and colored border gives some life to this quite simple layout. 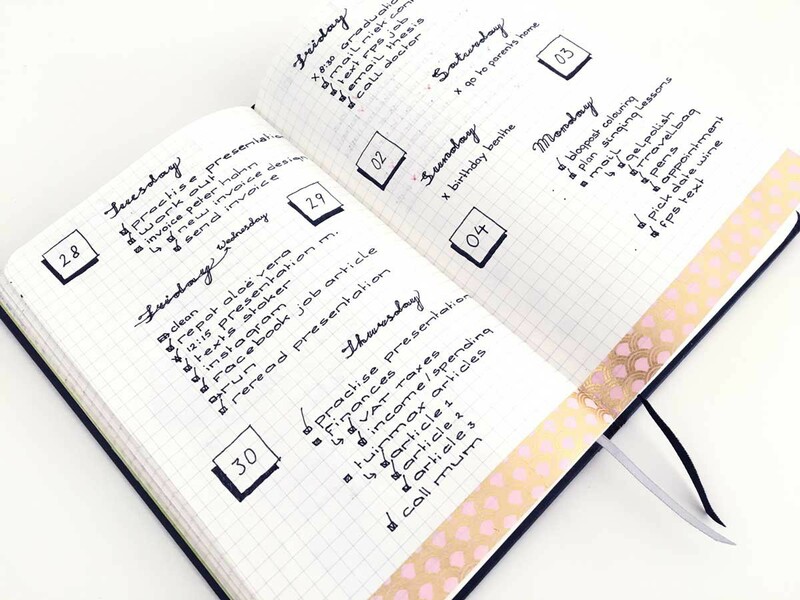 This layout is perfect for those with just a small droplet of time or for those that simply don’t feel for spending time on creating complicated layouts for their Bullet Journal. Minimalistic, neat and functional. 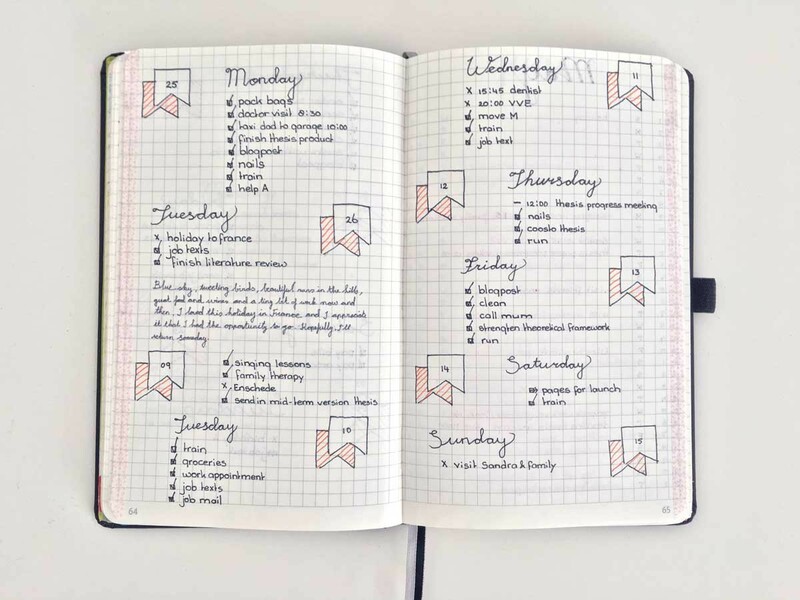 As you can see, I often go back to the basis of the first daily layout I ever made in my Bullet Journal. This one is a typical example of such a layout. The shadows of the flags are subtile colored. No doodles or fancy borders this time. 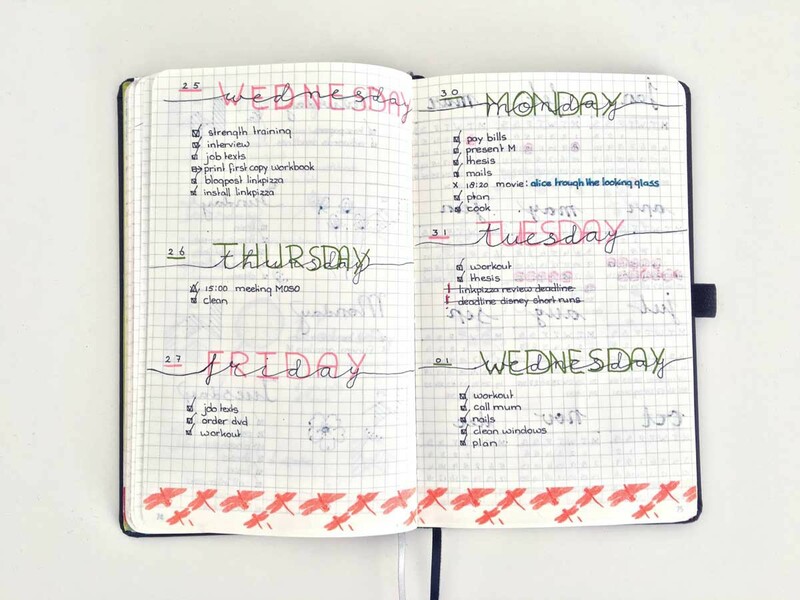 The subtle amount of color and the variance between tasks and journaling, gives enough excitement in this layout. The titels are darker and more obvious then in the previous layout. Besides that, a lot of doodles are drawn in order to make this layout stand out. In this layout I have tried something new with the titles of the days. Emphasis is more on the days instead of on the dates. Now and then it can be very handy to know on what time of the day you are the most productive. 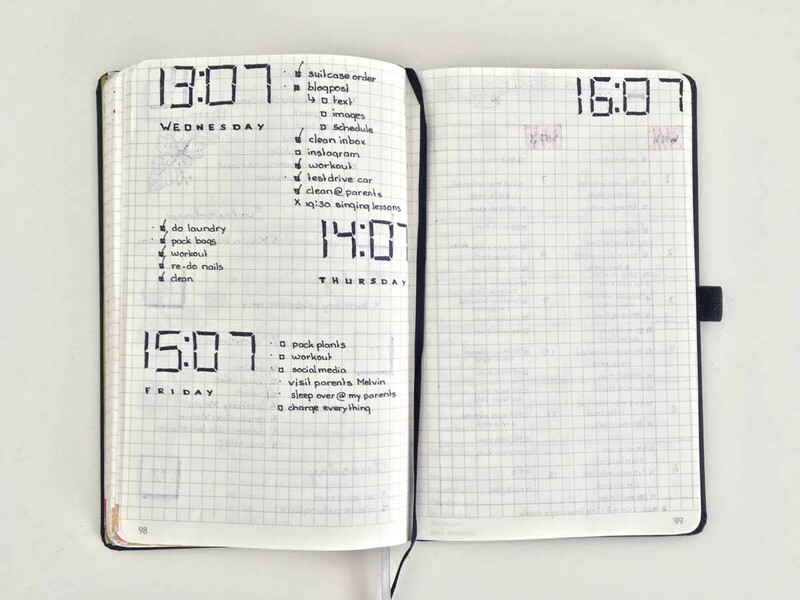 In this layout I experimented with time tracking. Both circles resemble 12 hours. 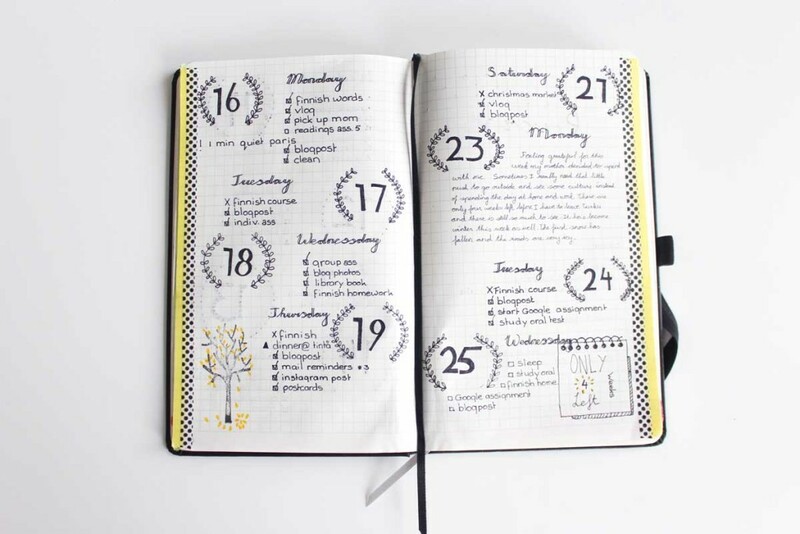 This gives you the opportunity to track your activities a whole day long. However, I wasn’t really content with this method, so after three days, I stopped making these circles. A new favorite. The font for writing down my daily tasks is now different then before. Also, the often used flags for marking the days are replaced by squares. Less ink is needed in order to give these squares proper shadows. On the bottom of the page, there is some light pink washi tape with golden details. I think this is my favorite washi tape ever! Last but not least, this again somewhat more minimalistic black and white layout. The digital times resemble the date with the day of the weer written beneath them. 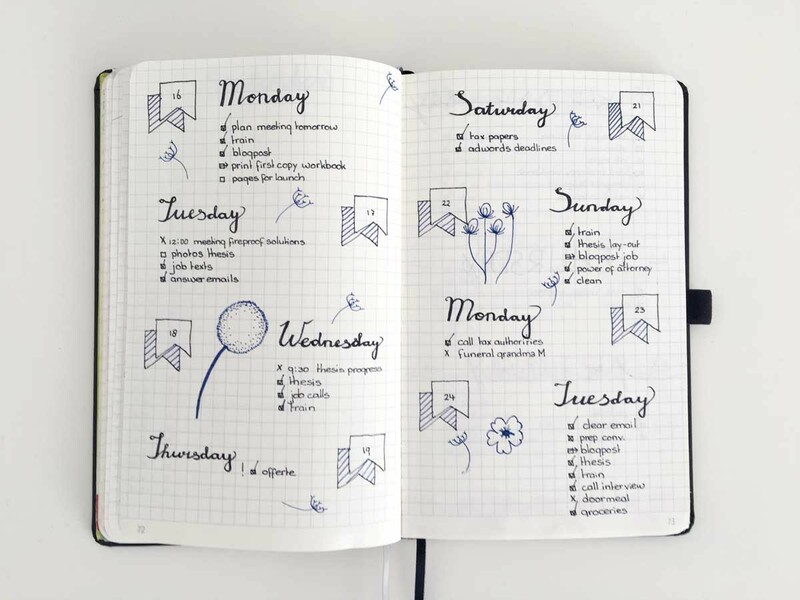 Little black and white doodles or inspiring quotes could make this layout even more of a success. What is your favorite daily spread? Wat een lief compliment! Het maken van de layouts lijkt veel lastiger dan het eigenlijk is hoor. 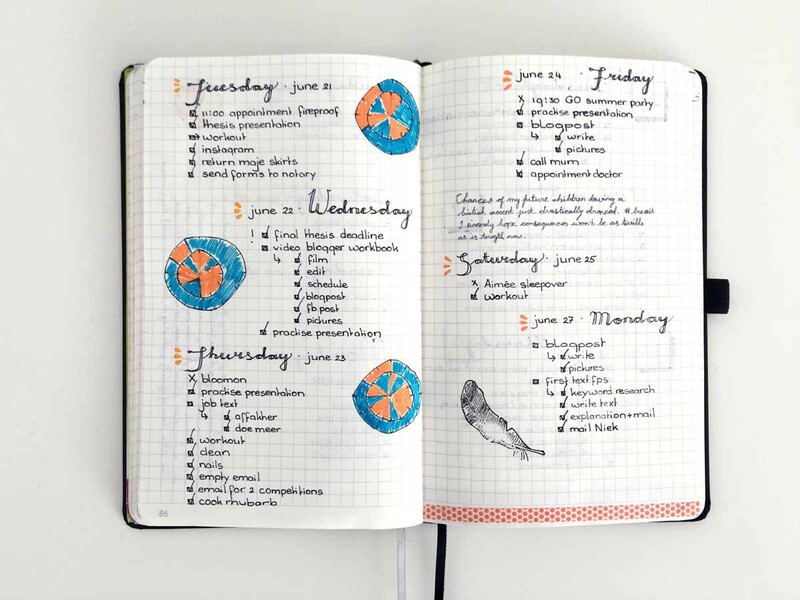 Ik besteed echt hooguit 5 minuten per dag aan het aanvullen van mijn Bullet Journal. Meestal besteed ik er nog minder dan die 5 minuten per dag aan. Wat gaaf als je ook je eigen journal begint! Moet je zeker doen, ik ben heel benieuwd met welke creatieve pagina’s je allemaal komt. Leuk! Kost alleen zoveel tijd, dat heb ik er helaas niet voor. Dat valt echt heel erg mee! Ik besteed hooguit vijf minuten per dag aan mijn journal. Vroeger heette dit ‘agenda’. Schijnt nog verkocht te worden in ouderwetse boekhandels. Scheelt een hoop kleur en schrijfwerk… Of is gefreubel juist de charme van het bulletin Journalist? 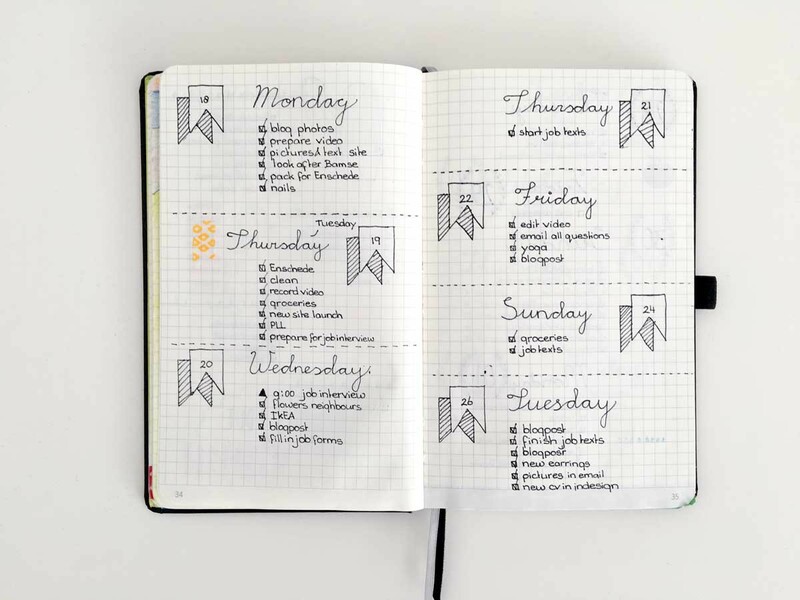 Het verschil tussen een agenda en een bulletjournal, is dat een bulletjournal op zo’n manier in te delen is dat het effectief en efficiënt werkt voor speciaal jouw behoeftes. Een agenda is al voorgedrukt en in dat opzicht minder flexibel. I really like your minimalistic layouts. I think that’s what bullet journaling is about. My preferred one is the one with the squares. Wat een leuke manier om daily lay-outs te laten zien! Ik ben afgelopen oktober begonnen met mijn Bullet Journal. Ik ben nog een beetje opzoek naar een leuke en drukke layout. Helaas zit hier geen geschikte layout voor mij tussen. Ik ben nog aan het uitproberen, ik houd namelijk erg veel van kleur, sierlijkheid en veel elementen. Het was leuk om je blogpost te lezen! This is sooooo nice ! I am planning to get a bullet journal asap after this post! Great to hear! I would love to see your journal once you’ve set it up. It depends on the week but mostly I set up only for the next day. It takes about one minute since I only write the bullet points for that day and don’t do any decorating. When I have more time (once or twice a week) I decorate my pages. Hoi! Wat super leuk! Ik ben er pas een beetje mee begonnen in een gewoon lijntjesschriftje maar ik merk dat ik dat niet zo handig vind. Nu vind ik de originele bullet journals met stipjes een beetje prijzig, en ben dus op zoek naar een iets goedkoper alternatief. Mag ik vragen welke jij hebt, en hoe duur die ongeveer was? Natuurlijk mag je dat vragen! Ik heb een boekje van Brunnen die ik kocht in Finland (het is een Duits merk) maar die kostte ongeveer net zoveel als een A5 Leuchtturm. Ik geloof dat het kruidvat een tijdje ook boekjes met stipjes heeft gehad, als goedkoper alternatief.